My mother grew up in a large multi-generational Mexican-American household. The memories that she has shared with me often revolve around food– her grandmother rising early to make fresh tortillas every day, the chile being cooked on the stove– how they gave a bowl of beans to anyone who showed up hungry, despite the fact that they were not well-off themselves. Food is one of those defining cultural characteristics of people’s heritage. Often when language and even many customs are lost, people hold onto food. For me, Christmas would not be Christmas without the authentic biscochos and bread pudding I bake every year, the tamales that I sweat through the making of with my mom, and the big pot of posole that my cousin makes for Christmas morning breakfast. 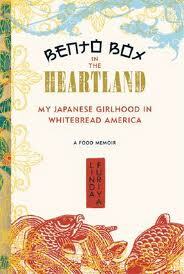 And so it is food that drives the memoir Bento Box in the Heartland by Linda Furiya. Furiya is a food writer for the San Francisco Chronicle, and Bento Box focuses on her childhood in post-WW II Indiana. Yup, Indiana- where hers was the only Asian family in town, and where her father had settled when he came back to the US after the war. This memoir is set up as a story of vignettes, usually revolving around one sort of food or a food theme. In those vignettes you find out about Furiya’s family, their history, and how food comes to be the main way that they try to told onto the culture in “whitebread America.” The book is brutally honest, and at times brutally painful. What is here is the voice of a little girl who never quite fit in– who was always aware of being Japanese-American, of being different (so afraid she would eat her Bento-box lunch in the bathroom rather than let the other students see the “weird” food that she ate.) As the book unfolds you discover her father’s hardship at having been a prisoner of war for years, and her mother’s hardship of giving up a career to marry a man she had never met in a country where she did not speak the language. Both grapple with the hard reality of being immigrant in America in a place where initially, they were seen with some hostility. And Furiya herself tries to make her way in a world with little extended family– most of them were in Japan, and she tried to move beyond her own narrow world and out into the greater world. Furiya’s book focuses a lot of the act of eating, and getting ahold of traditional Japanese food (mainly when it entailed a 6 hour drive to Chicago) in a place where it was not easy to find the ingredients. There is a great chapter on a family vacation that they take just so her father can go fishing in Florida. Along the way, Furiya comes to grips with her Japanese past and her parent’s past, as well as the roles that they embody (fairly traditional.) There are moments when the book is heart-wrenching but it is also eye opening and powerful. This is a really wonderful memoir about what it means to be a family and the immigrant experience in America. Highly recommended. If you were raised in a religious household, I think that you often spend much of your life living either in accord to what you were raised with, or in some tension with your tradition (whether you leave it altogether, join one that is similar but different, or decide to take an academic turn and spend your life studying it.) 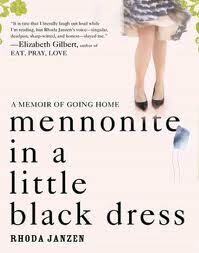 Rhoda Janzen depicts this tension in her memoir Mennonite in a Little Black Dress. Janzen, an English professor, hit a nasty patch during midlife. She survived the aftereffects of a major surgery that was botched, only to have her husband leave her (for a man), get into a nasty wreck thanks to a drunk driver that slams into her, and is then left with a mortgage she cannot pay. So what does one do when such a thing happens? Well, you go home for a spell, and let the people that love you take care of you. Janzen’s family are rather well-educated Mennonites, her father is a theologian and major leader in the church, and her mother was a nurse. As Janzen goes back home and begins to re-explore her relationships with her family and her community, details about her life emerge in a non-linear manner, and she begins to heal. A few things about the book. First of all, it is a non-linear read- she digresses a lot– some of it is a bit stream-of-consiousness. And is not an all-about-Mennonites book. Her family happens to be Mennonites and Janzen has rejected her childhood faith, but she doesn’t spend a lot of time talking about Mennonite life/theology/etc. Her humor has a biting edge to it- although sometimes it is really gut-wrenchingly funny. While she makes fun of her Mennonite family it is pretty clear that she absolutely loves them. Really, truly, loves them and finds a certain amount of security in the faith that she left that they continue to embody– even though it is no longer hers. As the book unfolds Janzen is pretty honest- she made some bad decisions- her marriage, which lasted 15 years was a rocky one, and her husband had always been iffy about his sexuality, was cruel and often emotionally abusive, but was also charming, smart, funny, and oh, yes, bi-polar. As the book unfolds Janzen realizes that the mess of her marriage was just as much her fault as his, because she allowed herself to get swept into this. Along the way, her family and friends help her sort it all out. Janzen’s mom almost steals the book. She is caring, hysterical and earthy. I had moments when reading the book when I was reminded of my mom, and Janzen lovingly outlines all of her mom’s quirks, often for maximum humor potential. She also waxes on Mennonite food– and her love for it. So it is clear that even though Janzen became an urbane, educated, agnostic college professor, there are some things from her Mennonite past that she will never shake. Such as her love for borscht. The book reads quickly and in places is very funny. It is a bit uneven, because I think this memoir in the end was more conceptual and stylized then perhaps a general audience would like. All the same, I really enjoyed it. Janzen has a great voice– honest, funny, and down-home and very real. 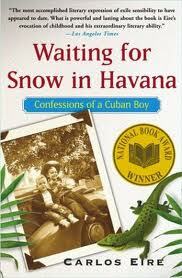 “The world changed while I slept, and much to my surprise, no one had consulted me.” With those words Carlos Eire begins the moving story of his childhood in Cuba, Waiting for Snow in Havana: Confessions of a Cuban Boy. The incident that changed the world was, of course, Fidel Castro’s successful overthrow of the Batista-led Cuban government in January, 1959, and the change was a dramatic one. The Revolution confiscated property, redistributing it to “the people of Cuba,” and would eventually tear children from their parents, as it did to Eire and his family. Though he and his brother were eventually reunited with their mother, the last time they saw their father was the day they were put on a plane at the ages of 11 and 14, exiles from their homeland. The majority of the book does not, however, dwell on this painful memory, but rather relates numerous tales from pre-Revolution Cuba. Eire does not tell a linear story, but rather gives vignettes from his childhood, often interrupted by digression upon digression, as one memory leads to another, sometimes resulting in a lengthy trip down a rabbit hole, other times teasing the reader with hints of what is to come. Through it all, Eire weaves a beautiful tapestry of Cuban life in the late 1950s told with poignancy and humor, often at the same time. His was a childhood filled with eccentric characters and games that would make twenty-first century American parents swoon: a family whose house had a zoo of sorts, including a pet monkey that once bit Eire on the arse and a mynah bird trained to shout obscenities; a game that involved throwing rocks at one another, as the boys’ carefree father looked on, bemused; trying to blast a lizard into orbit with an enormous firecracker (a paltry English word for the explosives known in Spanish as cohetes, “rockets”); chasing after a pesticide jeep on their bicycles, grabbing on to the bumper, and hanging on for a ride, despite the DDT spewing forth from the truck. These and other stories reveal the recklessness and zest for life that dominated Eire’s youth. Perhaps the most profound and moving aspect of the book, though, is Eire’s reflection on death in the last chapter, a reflection he gives in the context of describing his final day in Cuba. Referring to that day as his first death, he notes, “There are many ways to die. Only one kind is final, of course. But before that one pulls you under, many others come along, like waves at the shore” (375). If you read his story, you will understand what he means, and perhaps marvel, as I did, at his resilience in the face of such trials. 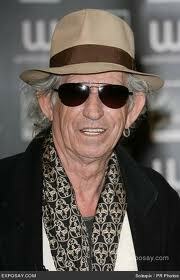 Perhaps you will also see the various deaths in your own life and resonate on some level with his experience. I decided to read Waiting for Snow in Havana in part because my own mother emigrated to the States through the Pedro Pan program, probably around the same time that Eire did. The book gave me a fascinating glimpse into the world of her youth and a deeper appreciation of how difficult this move must have been, a kind of death. But as Eire asserts (and, indeed, shows through this beautifully written book), “Dying can be beautiful. And waking up is even more beautiful. Even when the world has changed. Especially when the world has changed” (382). Whether you have an interest in Cuba or not, I highly recommend this book, for the humor – I laughed out loud numerous times, for the deep insights into the human condition, and for the elegant prose. Fifteen down, (at least) thirty-seven to go. UPDATE: In the small world category, it turns out my mother knew Eire and his mother when they lived in Chicago!